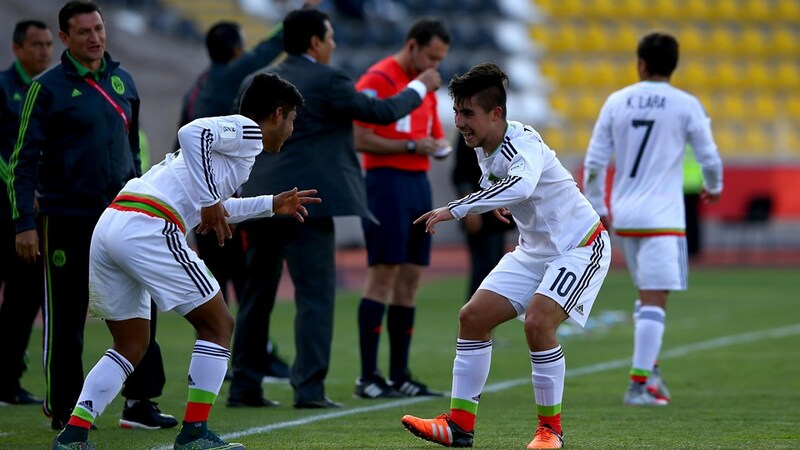 Coquimbo, Chile — Mexico’s U17 defeated their Ecuador counterpart, at Estadio Francisco Sanchez Rumoroso, with a score of 2-0 and advanced to the semifinals stage. The match was witnessed by a crowd of 3000 is the first game in the FIFA Under 17 World Cup where Mexico does not enjoy a possession advantage. Mexico played without zaguero Fernando Venegas. Venegas partnership with captain Jose Esquivel has been the heart of the Mexican defense which has ceded only 2 goals. Venegas had to serve a one game suspension due to an accumulation of yellow cards. Mexican upstarts Kevin Magana and Pablo Lopez would be shades of their old selves as the Ecuadorians would mark them closely and pressure them into ceding possession to a teammate or opponent. Instead, it would be midfield general Alan Cervantes to lead the charge as he would snuff out deadly Ecuadorian counterattacks, time and again, before they had a chance to develop. Cervantes, hailing from CD Guadalajara, showed his grit on the day as he rode challenges and tackles from the quick and physical Ecuadorian players. The opening minutes belonged to Mexico’s as they exploited space with right winger Kevin Lara. Lara would provide service that strikers Eduardo Aguirre and Claudio Zamudio would not connect with. The Mexican frontline would press Ecuador into ceding possession and inhibit their ability to leave their half of the pitch. It wasn’t until the 30th minutes that Ecuador began showing initiative, enjoying possession and space as they had adapted to Mexico’s horizontal and vertical ball movements. Mexico broke the scoresheet at 40th minute mark with a set piece earn by Aguirre who was fouled by Ecuadorian centerback Jean Peña. The goal came from the boot of Zamudio who would knock in a re-centered header won by Mexican centerback Bryan Salazar. Salazar slotted into the lineup for the suspended Venegas. Salazar would drill in the second goal of the game off a penalty on Jose Gurrola, as Gurrola was brought down by Peña inside the penalty box. Gurrola had substituted in for Zamudio less than a minute earlier. A dream debut for Salazar as he played a hand in both of Mexico’s goals. After going up two-nil in the 53rd minute, Mexico decided to sit back, absorb pressure, and counter Ecuador’s ventures forward. Mexico will face Nigeria without leftback Ulises Torres who earned a yellow in this match and a one game suspension after accumulating two yellow cards. The two nations previously played in 2013 U17 World Cup Final which Nigeria won with a score of 3-0.